Delivering quality lubricants using dedicated clean lines. We strive for integrity and value when it comes to our service and products that we provide. Our bulk oil services have dedicated containers and lines for all products that we carry in bulk. Using dedicated lines is considered a “best practice” in the oil industry, because it minimizes the chance of contamination. 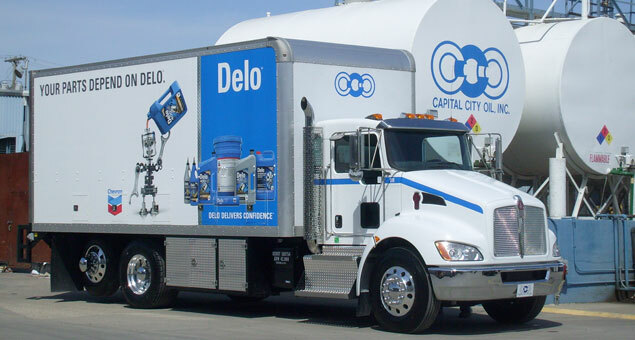 We carry a full line of passenger car motor oils, heavy-duty motor oils, hydraulic oils, gear lubricants, greases, antifreeze, and window wash.
Lubricants and additives deliveries are based on our customers’ preferences to ensure they have product when you need it, whether that ‘keep-full routes’ or order as needed. Our delivery drivers each have a designated route, in order to build a consistent relationship with each of our customers. We are also happy to fill orders on a call-in basis, when the need arises. While the presentation was great and savings were great the reassurance that I had made the right decision came from their delivery driver. This young man that delivered our oil and fluids, delivered with a level of care I have NEVER seen from a delivery driver, much less one delivering oil. The care he took was like he was delivering bottles of Glenlivet 25year old single malt scotch, from a truck that was beautiful and very well taken care of. But what impressed me most, he wiped his hoses off before he rolled them back up into the truck making sure everything was well taken care of and pristine for his next stop. I knew at that point, if the guy who is delivering cares this much, so does everyone else he reports to in the organization. Make sure what you need is there when you need it.